Welcome to the Autumn issue of the CeRDI newsletter. With so much activity going on it is important to pause, reflect upon and celebrate recent achievements. We hope you enjoy the stories and updates presented. In March 2016 a morning tea was held to welcome three new post-graduate students to the CeRDI team. New HDR students in CeRDI include: Chris Bahlo, Thomas Hill and Shirish Sharma. In April, the premier conference for spatial and surveying industries across Australia and New Zealand – Locate16 – was held, and provided multiple opportunities for CeRDI staff and HDR students to contribute to broader sector and industry understanding of disruptive technology for a smarter society. Dr Angela Murphy and Rob Milne gave presentations as part of the conference research program. Further details are presented in the ‘News Snippets’. A highlight at Locate16 was the Asia Pacific Spatial Excellence Awards (APSEA) with two CeRDI projects becoming finalists. FedUni and the Corangamite Catchment Management Authority received the Environment and Sustainability award for the Corangamite Soil Health Knowledge Base project (see below): Historic Urban Landscapes (HUL) and Visualising Ballarat, a collaboration between CeRDI and the City of Ballarat, was a finalist in the People and Community category. Other recent outcomes at CeRDI are the completion of numerous research reports and project milestones. These include finalisation of research reports for HUL and Visualising Ballarat, Online Farm Trials, Western Business Accelerator Centre for Excellence and the Great South Coast Digital Strategy. Climate Ready, a project that CeRDI staff have worked extensively on since 2014 was officially launched at Mt Martha during March and, closer to home, Commerce Ballarat’s new online services were also launched during March. We hope you enjoy learning more about these and other research activities showcased in this newsletter. CeRDI and the Corangamite Catchment Management Authority have been awarded an Asia Pacific Spatial Excellence Award (APSEA). 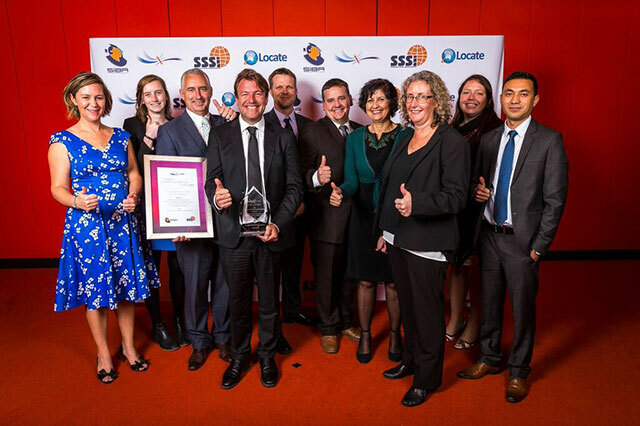 The award was announced during a gala presentation held during the Locate16 conference at the Melbourne Convention and Exhibition Centre in April. The Corangamite Soil Health Knowledge Base qualified for the APSEA awards after receiving a Victorian Spatial Excellence Award in 2015. The project then advanced to compete with other Environment and Sustainability Award winners from Australia, New Zealand and the Pacific Islands. The Corangamite Soil Health Knowledge Base provides essential knowledge required to implement the South West Agricultural Soils Plan across 15 landscape zones in the Corangamite region. The Corangamite Soil Health Knowledge Base has established a comprehensive knowledge base of soil health information that is assisting the broader community to implement local catchment plans across the Corangamite region. Project partners include the Corangamite CMA and the Corangamite CMA Land Health Program Steering Committee. “Community and partner engagement, prioritising a high level of co-creation and continuous innovation have been central to success with Corangamite Soil Health Knowledge Base project”. “It provides soil health information to farmers to encourage management practice change to create an enhanced sustainable agriculture sector in south-west Victoria”. CeRDI was also a finalist for the Award for People and Community for the Historic Urban Landscapes (HUL) and Visualising Ballarat project. HUL and Visualising Ballarat has been established in collaboration with the City of Ballarat to provide insight into Ballarat’s past, present and sustainable futures. The portals have been designed to assist stakeholders, community members, practitioners and researchers to collaborate and identify community values, landscape values, with information about acceptable levels of change and to provide certainty as to priority development to attract and support. This participatory UNESCO-supported project is enabling a deeper understanding of values in the historic urban landscape to guide decisions to help Ballarat grow without compromising its heritage or losing its character. Photo from left to right: Daina MacLeod, Meghan Taylor, Gareth Smith (CEO Corangamite CMA), Bret Ryan (Land Health Manager Corangamite CMA), Robert Milne, Andrew MacLeod, Angela Murphy, Helen Thompson (Director of CeRDI), Jessica Sautner, and Himalaya Singh. For further information about CeRDI’s involvement at these awards, please contact Asso Prof Helen Thompson. Above: Sharing in the award success is the Corangamite Soil Health Group together with CeRDI's Peter Dahlhaus and Helen Thompson. 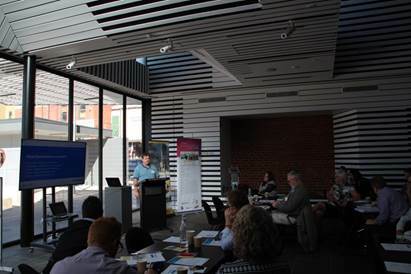 In early March, CeRDI worked in collaboration with the City of Ballarat to conduct a workshop to establish a collaborative strategy for the future progression and transformation of Visualising Ballarat. 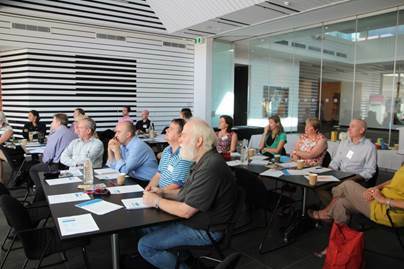 The workshop was well attended by staff from the City of Ballarat and representatives from organisations including the Museum of Australian Democracy Eureka (MADE), Southern Rural Water and the Public Records Office. The workshop format comprised core activities and presentations, culminating in a discussion on how innovation in Ballarat is aligned with international imperatives for combining technology, creativity and community to create a Smart City. A demonstration of portal prototypes and active portals was provided, followed by a presentation outlining recent CeRDI research activities related to Visualising Ballarat. The session concluded with a group discussion about the vision and strategy for Visualising Ballarat into the future. Various initiatives and activities were raised during discussion as the basis for future expansion. Dr Angela Murphy co-ordinated the workshop event with involvement from the City of Ballarat and CeRDI staff, Andrew MacLeod in particular. During 2015, impact research into HUL Ballarat was conducted by staff at CeRDI, led by Dr Angela Murphy. The first wave of research captured substantial baseline data from key stakeholders to support the assessment of longer-term impacts of HUL Ballarat. Research examining the impacts on practice across and within community, planning, business and research environments will occur in the future. As an outcome of this research, recommendations were provided to support future development of HUL and Visualising Ballarat. Climate Ready has been designed to provide residents, businesses and holiday makers in the bayside councils of South Eastern Melbourne with a better understanding of the impacts and risks of climate change, including the increased risks of flooding, fire, drought and heatwaves. Climate Ready was officially launched on 3 March 2016. CeRDI has worked on this project since June 2014 and has undertaken extensive community engagement (surveys and focus groups) to inform the development of this comprehensive online resource. 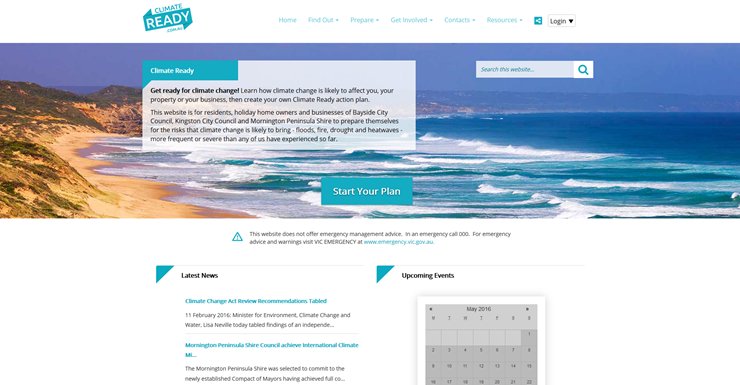 A unique feature is the Climate Ready Action Plan that allows users to identify their own local climate change risks and create a personalised action plan. Guest speakers at the launch event included Ms Kelly Crosthwaite, Regional Director, Department of Environment, Land, Water and Planning (Port Phillip Region) and mayors from each of the three partner councils for the project; Mornington Peninsula Shire, Kingston City Council and Bayside City Council. Councillor Mayor Tamsin Bearsley, City of Kingston, described how her family used Climate Ready to create a comprehensive action plan that they are now beginning to implement. She spoke about the significant difference Climate Ready would make to regional preparedness for climate change. 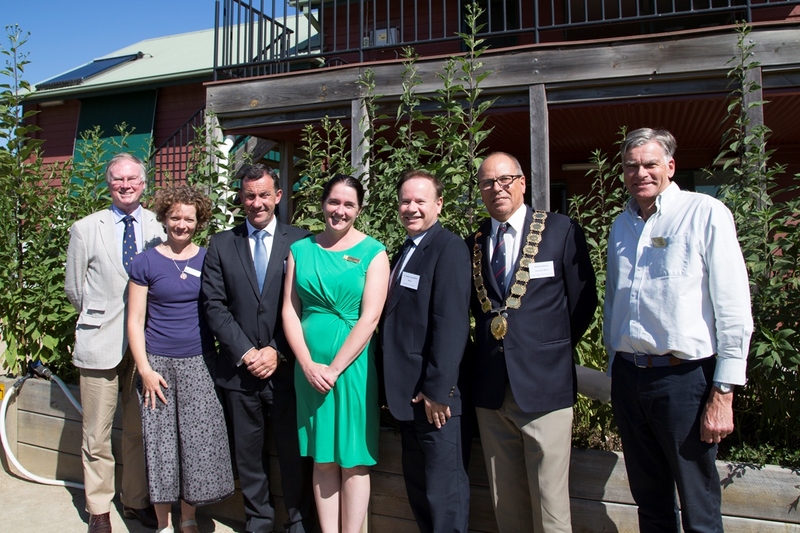 At the launch of the Climate Ready website at the Shire’s Eco Living Display Centre: (Left to right) Cr Hugh Fraser – Nepean Ward Councillor, Mornington Peninsula Shire; Kelly Crosthwaite – Regional Director Port Phillip Region Department of Environment, Land, Water and Planning; Carl Cowie – CEO, Mornington Peninsula Shire; Cr Tamsin Bearsley – Mayor, Kingston City Council; Cr James Long – Mayor, Bayside City Council; Cr Graham Pittock – Mayor, Mornington Peninsula Shire; Cr David Gibb – Seawinds Ward Councillor, Mornington Peninsula Shire. CeRDI Director, Associate Professor Helen Thompson, described Climate Ready as a ‘one-stop-shop’ that provides easy access to information about preparing for heatwaves, bushfire, drought, flooding, and severe storms. She further commented that Climate Ready will offer “an invaluable tool for helping communities to prepare for the risks climate change is likely to bring”. The next steps for the project include a social media and marketing campaign and a series of workshops to introduce Climate Ready to local businesses and communities. There is also potential for expansion of the geographical area of focus for Climate Ready with a number of local government authorities expressing interest in joining the project. For further information about this project please see the Climate Ready website or the walkthrough video. The CeRDI Online Farm Trials (OFT) team has recently returned from a busy schedule of visits around the country, attending events and conducting demonstrations of the OFT research tools. OFT Manager Rob Milne recently hosted information stands and delivered presentations at grain research forums in Adelaide, Cowara, Perth and Bendigo to demonstrate the OFT system and promote its uptake amongst grower groups, agronomists, researchers and data custodians. These activities provided an opportunity to showcase OFT to interested stakeholders. During the recent visits the CeRDI team observed that interest in OFT has grown, including from private consultants and industry groups. A highlight of the recent ‘tour’ was a meeting between the OFT team and Dr Yvette Oliver at the Centre for Environment and Life Sciences, CSIRO Floreat (WA). Dr Oliver was one of the first industry experts to express an interest in OFT. The opportunity to meet with Dr Oliver to learn more about soil research in Western Australia and to showcase the OFT research capabilities was highly valuable. Discussions at the meeting have since generated some development ideas with the aim of making trial research more comparable through improved integration of soil information in OFT. 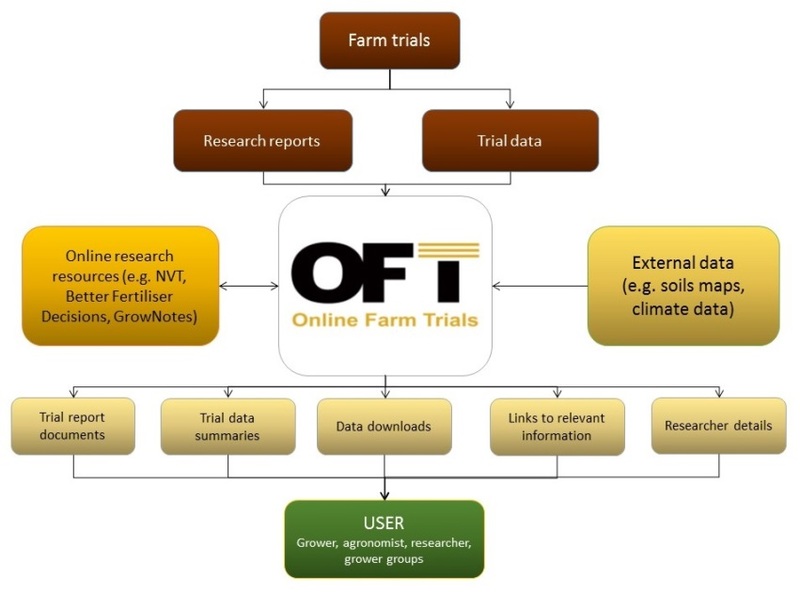 For further information about Online Farm Trials visit www.farmtrials.com.au or learn about the trial search and filter tools. CeRDI’s Dr Angela Murphy has been leading the first wave of impact research into the role of OFT in decision making and practice change involving industry key stakeholders. Research has explored factors relating to project implementation and development, knowledge building, behaviour change and informed decision making. The first stage of a longitudinal research program has recently been completed. The research involved extensive stakeholder consultation with industry and grower groups across Western Australia, Queensland, New South Wales, South Australia and Victoria. To date, the research findings into OFT have provided unanimous support for its development and adoption by the industry: the technology facilitates ease of accessibility, usability and confidence in data quality. The research also provides additional insights about current/future user needs and requirements, ensuring OFT remains responsive to stakeholder needs. Further research will explore the impact of OFT on decision making and practice change, farm development and environmental management processes, as well as enterprise enhancement and identifying whether there are opportunities for broader intergenerational change. Second wave research is currently being planned and will commence later this year. The research report will be publically available by mid-May on the CeRDI website. For further information about the OFT research, contact Dr Angela Murphy: aa.murphy@federation.edu.au or learn how why Southern Farming Systems has become involved by watching the video at www.youtube.com/watch?v=8Xe6LYLhS9Q. Photo of a Curlew Sandpiper at the Western Treatment Plant, south-west of Melbourne, an internationally important site for migratory shorebirds. This species has recently been uplisted to Critically Endangered under the EPBC Act, on the basis of significant population declines in the EAAF. Photo courtesy: Danny Rogers. 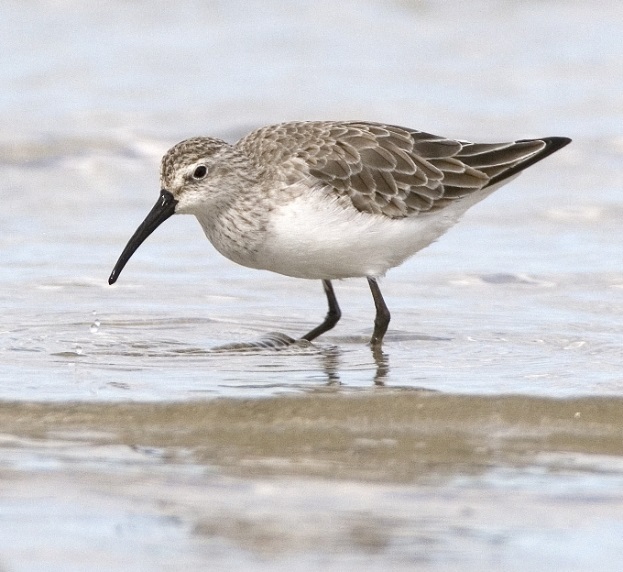 The Australian Government Department of the Environment is responsible for the development and implementation of policies specifically written for the protection and conservation of Australia's shorebirds and their habitat. To ensure estimates remain as current and reliable as possible, the department needs to produce new population estimates for 37 migratory shorebird species listed under the Environment Protection and Biodiversity Conservation Act 1999 (EPBC Act). CeRDI’s Dr Birgita Hansen is leading a team of scientists from the University of Queensland, the Victorian Department of Environment, Land, Water and Planning, and the Australasian Wader Studies Group, on behalf of BirdLife Australia, to update these population estimates. Under the EPBC Act, ‘important habitat’ is a key concept for the conservation of migratory species. Defining this term for migratory shorebirds in Australia is important to ensure that habitat necessary for the ongoing survival of the 37 species is appropriately managed. Wetland habitat is considered nationally important if it regularly supports 0.1 percent of the flyway population of a single species of migratory shorebird. A flyway is a grouping of similar routes used by shorebirds during their annual migrations between breeding and non-breeding areas. The most recent migratory shorebird population estimates were produced in 2008. Since then, many shorebird species have significantly declined across key Australian monitoring sites. These declines herald major changes in East Asian–Australasian Flyway (EAAF) populations and have implications for conservation and management of shorebird habitat in Australia and overseas. Birgita’s team has an internationally recognised track record of collecting, managing and analysing shorebird population data in the EAAF. In addition to their own experience, team members are closely involved and connected with the people and groups collecting shorebird data in Australia and throughout the EAAF. Two expert workshops were convened in Melbourne in early 2016 to determine the best methodological approach for undertaking the revision. In recent weeks, preliminary estimates have been circulated to other shorebird experts in Australia and overseas, for review. The comments from this expert review will be used to adjust state and country-based estimates to ensure they reflect the best available knowledge about shorebird distribution and abundance. This project is due for completion by the end of this financial year. 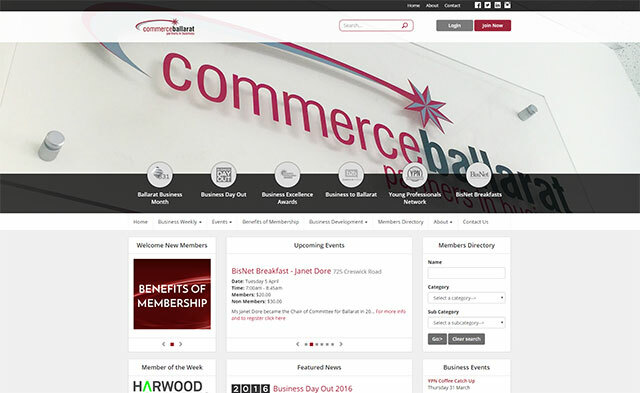 Commerce Ballarat, the independent business group uniting Ballarat’s business and commerce sector, launched its new-look online services in March 2016. CeRDI collaborated with Commerce Ballarat to develop and deliver an intuitive technology platform catering for staff, members and the general public. The new online services have been developed to enable members quick and easy access to information using mobile, tablet or desktop devices. Furthermore, the new online design and branding has provided an updated, contemporary look and feel, further complementing the other changes to have taken place. The Western Business Accelerator and Centre for Excellence (Western BACE) is a multifunction facility, built with the aim of fostering business, education and innovation in Melbourne’s West. Located in Melton, Western BACE was launched in May 2015 and offers a range of business services and tenancy programs for start-up businesses (through the business accelerator program; co-working space) and anchor tenancy for established businesses. Education and training opportunities are also offered at the facility. A research program together with ongoing monitoring and evaluation has been established for the Western BACE project by CeRDI as a member of the Western BACE Research Group (in partnership with City of Melton and Victoria University). Research has been undertaken across each of the three development phases of the Western BACE (planning and design, construction and operation). The most recent CeRDI research, led by Alison Ollerenshaw, involved interviews with Western BACE tenants to gauge their motivations, impressions and expectations of the program. The findings highlighted the diversity of experience of this first cohort of tenants at Western BACE. The breadth of their collective experiences indicates a strong connection between tenants and the business accelerator program which is closely aligned to expectations for their business, and anticipated business growth. Complementing this is the support they have received since commencing in the program. The findings provide initial insights into tenant experiences in incubators and accelerators. Ongoing research, drawing widely upon the experiences of tenants over the longer-term has been recommended and will be implemented through a PhD program commencing in July 2016. Wind and Sky Productions have been working closely with CeRDI to produce two new documentaries for Online Farm Trials and the Natural Resource Management Planning portal. The documentaries provide insights into both web portals and explore how these innovative online technologies are being utilised by project partners, industry groups and key stakeholders. 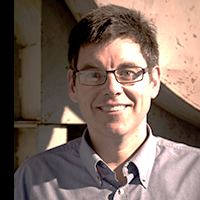 Andrew MacLeod is the Manager, Technical Projects and a member of CeRDI’s Senior Leadership Team. He completed his Bachelor of Computing and Honours in Applied Science (Information Technology) at FedUni (then the University of Ballarat). In 1999, Andrew commenced his career with CeRDI (then known as the Centre for eCommerce and Communications) as a web developer. In 2000 Andrew was promoted to Technical Lead for the Mainstreet.au regional portal project, which was funded by the Commonwealth Government Networking the Nation program. After taking ‘time out’ to travel and work in the UK and Europe in 2001 Andrew returned to Ballarat and assumed the role of Manager, Technical Projects, a position that he has held since mid-2002. 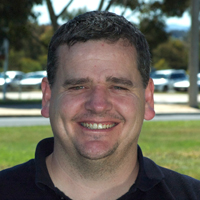 During the early stages of his career, Andrew worked predominantly on regional portal development and communities of interest; however, the diversity of project activities in the Centre saw him work closely on projects with a national reach, including Young Australian Rural Network (YARN) and Rural Law Online. As the size of the technical team grew between 2004 and 2010, Andrew’s responsibilities evolved to include an increased focus on project management and the day-to-day supervision of technical team members. He completed a Graduate Diploma in Project Management. Andrew has developed a keen interest in spatial technology, initially through research directed towards assessing the potential of web-based geospatial technology in a feasibility study for the Corangamite Catchment Management Authority in 2005–06. Subsequent support internally, from the University, led to the beginnings of the advanced spatial capabilities CeRDI is best known for today. “Peter’s vision and foresight led to the development of the initial UB Spatial Groundwater Bores application. Without this, the Visualising Victoria’s Groundwater project would never have been conceived. By building the trust of the data providers and other key players, the partnership was developed which was able to attract multi-year research funding from the state government and others”. The VVG project was the catalyst for Andrew to focus on research and development directions for the Centre over a two year period. Andrew collaborated with experts from CSIRO, the Australian National University and the Bureau of Meteorology, gaining expertise in data interoperability and spatial data interchange standards. This knowledge has been critical to the CeRDI’s recent involvement in the development of international standards for groundwater and soils data and as a test bed for the technical implementation of these standards. Andrew now leads the strategic technical direction of the centre as well as acting as a key liaison between the technical team and the research/HDR cohort within CeRDI. A degree in chemical engineering and a MBA have served David well across his 28 years working in manufacturing. In 2015, David commenced a PhD investigating the barriers to using stormwater as an alternative water supply for a city. In March 2016 successfully completed his confirmation of candidature. Higher demand and climate change is exerting increasing pressure on existing water supplies. Extraction of fresh water to supply cities places stress on the environment, and stormwater from impervious surfaces can cause downstream ecological damage. The ‘Water Sensitive City’ has been proposed as a vision for a sustainable future. The use of stormwater has been recognised as both providing additional water and positively impacting the environment. The impervious surfaces in a city result in higher water yield than natural catchments, and they increase automatically as the city expands. Despite this, the amount of stormwater reuse in Australia is less than five percent. Much of the work around stormwater use has focussed on specific elements to make it possible. Different insights into the barriers to achieving the goal of an alternative water supply may be achieved by taking a systems approach. As stormwater use has hydrological, economic, environmental and social implications, a holistic analysis must be done to enable all the impacts to be understood. A case study of stormwater use potential in Ballarat is proposed. Economic, environmental and social indicators will be considered. A decision tool that compares the impact on the levelised cost of water, the ability to establish pre-development flow regimes and the social acceptance of each proposal will be developed. Dr Angela Murphy and Jessica Sautner recently prepared an application for funding from a Telematics Trust grant in consultation with the Geography Teachers' Association of Victoria. Funding was sought to undertake a project for the development of curriculum resources to embed the real world application of spatial technology across the primary and secondary geography and science curriculum. The curriculum resources would be linked to real life data sets across agriculture, environment, geology and hydrogeology, urban planning and natural disaster management. Although funding from the Telematics Trust was not secured due to the competitive nature of the grant program, project partners have decided to progress implementation activities while continuing to explore opportunities for external funding. CeRDI recently submitted an award application to the iAwards, the premier awards program for innovation in the Australian digital economy. The awards celebrate homegrown innovative problem solvers. CeRDI's application showcased the innovation of the Online Farm Trials research. Victoria's state winners will be announced on 29 June 2016. Winners from the State iAwards will then pitch to the judges in advance of the iAwards presentation and gala dinner on 1 September 2016. CeRDI Director, Assoc Prof Helen Thompson presented on behalf of FedUni at an event showcasing research excellence at Investment Centre Victoria in late February. The event was organised by the Department of Economic Development, Jobs, Transport and Resources. Dr Angela Murphy presented at the Electronic Visualisation and the Arts Australasia 2016 Conference from 5-6 March in Canberra. Dr Murphy's paper with Assoc Prof Helen Thompson and Assoc Prof Peter Dahlhaus was entitled Making intangibles tangible: Visualisation informing, engaging and empowering community for embedding cultural heritage within the public domain. Dr Murphy presented the findings from the impact research conducted for Historic Urban Landscape Ballarat alongside other national and international researchers. Dr Angela Murphy and Rob Milne presented papers at the Locate16 Conference in April. The titles of the presentations were Historic Urban Landscapes and Visualising Ballarat: Citizen participation for sustainable urban planning and design and Engaging Communities for Prioritising Natural Resource Management and Biodiversity Conservation Actions. The CeRDI 2014 Annual Report showcases the significant achievements in research and innovation for the centre during 2014. The report includes the developments that have been achieved in building upon the technologies and approaches developed through Visualising Victoria's Groundwater (VVG) including innovations with projects including Online Farm Trials and CropPro. RUN Regional Futures Conference: The Regional Universities Network (RUN) of which FedUni is a member university, is holding its annual conference at Central Queensland University, 21-24 June in Rockhampton. Themes for the conference include sustainable, health, prosperous and connected future for regional Australia. CeRDI will have a strong presence at this conference with a group of staff and students attending and presenting their research. Director Associate Professor Helen Thompson will attend, together with four post graduate students from the centre. Next year's 2017 RUN conference will be held in Ballarat. 43rd International Association of Hydrogeologists Congress, September 2016: Associated Professor Peter Dahlhaus will be presenting and convening a session at the conference to be held in France later this year. 2016 Safety World Conference, September 2016: PhD student Himalaya Singh has been accepted for a poster presentation in Finland in September. Himalaya's research title is ‘Geospatial analysis of sports and injury hospitalisations in Victoria, Australia’. In March CeRDI welcomed the following post-graduate students. Each student is undertaking a PhD and has been awarded a scholarship for the duration of their studies. Chris Bahlo: PhD Title: Developing and implementing intraoperative agricultural data exchange standards. Industry partner for this research is the Regional Universities Network Precision Agricultural Flagship. Supervisors Associate Professor Peter Dahlhaus (Principal Supervisor; FedUni) and Dr Mark Trotter (Associate Supervisor; University of New England). Thomas Hill: PhD Title: Unheard farmers: strengthening precision agriculture by capturing knowledge using the social sciences. Industry partners for this research are the Regional Universities Network Precision Agricultural Flagship and University of Southern Queensland. Supervisors: Dr Angela Murphy (Principal Supervisor; FedUni), Professor Bernard Schroeder (Associate Supervisor; University of Southern Queensland) and Associate Professor Helen Thompson (Associate Supervisor, FedUni). Shirish Sharma: PhD Title: Using interoperable standards for visualisation of spatio-temporal data to aid in sustainable development of Ballarat within the integrated framework of HUL and Smart Cities. Industry partner for this research is NICTA (now Data61, CSIRO). Supervisors: Associate Professor Peter Dahlhaus (Principal Supervisor; FedUni), Dr Angela Murphy (Associate Supervisor; FedUni) and Dr Iman Avazpour (Associate Supervisor; NICTA Data61, Deakin University). Congratulations to David Ebbs who successfully completed his PhD confirmation of candidature on 18 March 2016.